The only time I ever gone around the island in one trip was back in 1981. It was with some random guy from another school during my school mates round island trip. LOL as the head girl who only ride the head boy motorbike back in Form Five, I had to maintain standard and picked one good looking, very tall guy from Heng Ee to go around the island at 17 years old. The below photo is at Balik Pulau on the way to Telok Bahang. 800 is a iconic location for cyclists. The 800m is to point that it is 800 m to the Tropical Fruit Farm. However for us cyclists, depending on which way you are cycling, it is a sign of either going downhill or uphill. Yesterday was my only second time passing here. The other time was in 2016 when I took part in CFAL 8. 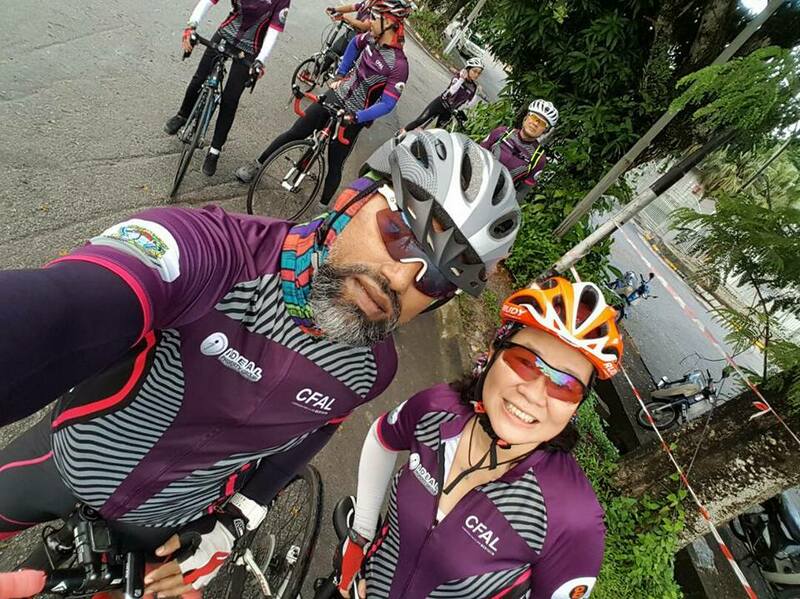 CFAL or Campaign For A Lane is an annual cycling affair with thousands of cyclists from all over the world and Malaysia. However, last year, I could finally boast that I had conquered the round island on a bicycle at age 51. Solo. Well not entirely solo because 3,500 riders with about 1,000 ghost riders (those people who never pay money to join but enjoyed the closure of roads type la) also participated la. Well, I did not exactly complete because it was rather late and about to rain so I went up the lorry at the last 20 KM. This year, I cheated a bit and thought I could almost finish it. But cramps held me back at Copthorne Hotel which is very near the Finish line. But again, up the lorry I went with pride. Cos the other buffaloes in the lorries are all males so yay, another round island trip in one single trip. On my bicycle and some parts had to walk and hobble when my legs cramp. The above is Pastor Cheah. Back in Feb this year, I had the chance of riding with him on his motorbike as he led a group of Malaysian and Singaporean cyclists through Chiang Rai to the Golden Triangle. 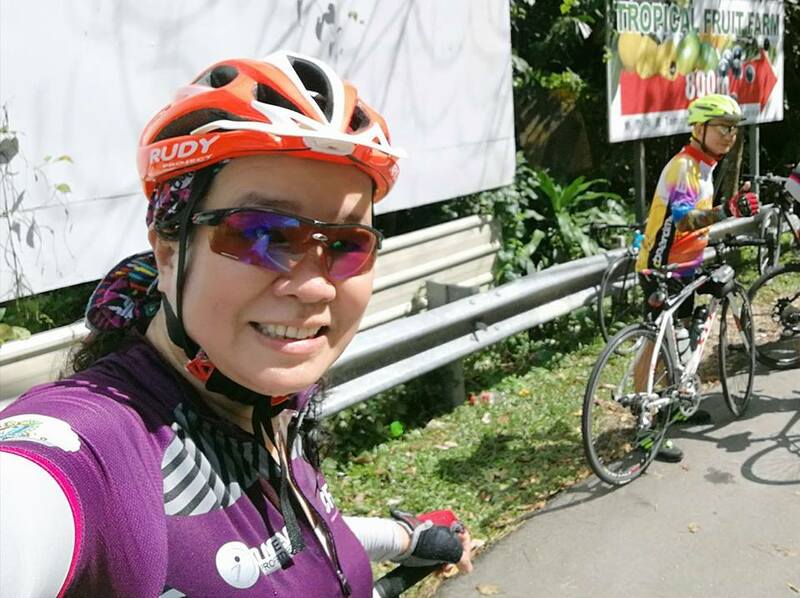 In the 11 hours ride, I had learnt a lot from Pastor Cheah. About faith, about God and about doing things. 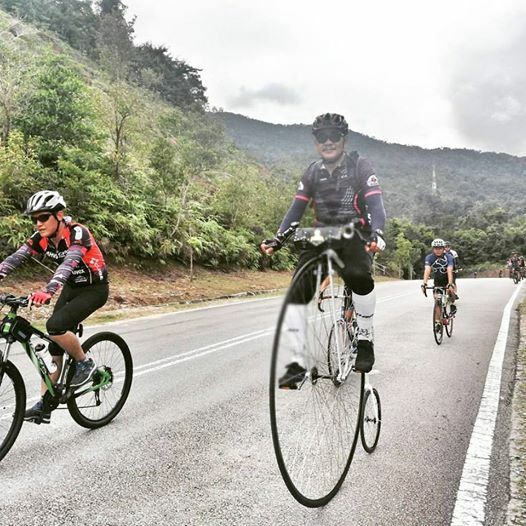 Pastor Cheah said he is coming for this CFAL 9 using his Penny Farthing because he said he wanted to inspire people to ride. He said, “If I can ride a Penny Farthing around the island, anyone with two wheels can do the same.” Pastor Cheah is from Penang but had set up an orphanage in Chiang Rai. His Penny Farthing has no brake, and has no gears. So can you imagine the difficulties? My mountain bike has 30 gears so I cannot say ‘cannot’. It takes guts and very strong determination. Though I have biking friends, I prefer not to join as a group because I cannot catch up and do not want to slow them down. I met Kumar and our regular Bike On Saturday Sunday (or BOSS) gang. They had gone ahead while I slowly climb the hills of Bukit Genting and Balik Pulau. So I took my leisure ride, feeling nauseous in the beginning stage as I felt sour Milo in my throat. Then, cramps got to me but lucky my threshold of pain is high so I endured that too. Therefore, I can now look back and claimed that I had gone around the island on bicycle more than I had done with car. Actually I had never done round island car ride before. And I can do it without one handsome looking guy to ride in front. So yeah, another feather in my cap.